The election of Donald Trump as the 45th President of the United States has broken the rulebook of politics, and many are claiming that the media holds some responsibility for this upset in American politics. We have seen a lot of talk recently of ‘false news’. This has worked both for and against the President, and these days such ‘news’ is easy to generate. 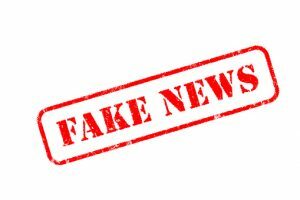 False news can work in the favour of those who perpetrate it, because it can create more discussion around matters that can be advantageous to a politician campaigning on an issue. For example, there has been false news about the impact of immigration on nation states, in terms of crime numbers, costs, and so on. While discrediting this news with hard facts might be expected to work in the favour of those defending immigration, in reality it makes the general subject of immigration more salient to voters. This can often benefit those who want to impose more controls on it. As a result, we have seen Brexit—a decision largely driven by concerns over immigration—and the election of a US president who intends to use physical barriers to address the ‘problem’ by building a wall and somehow getting others to pay for it. Factual news can also be dismissed as false news because people are becoming more dismissive of news in general, while others are becoming more concerned about what is genuine. This is also having an impact on the way we shop. For example, consumers may be less likely to buy branded goods, particularly online, for fear of counterfeiting. On the other hand, counterfeiting has benefited some other people, as many like to have the option to buy pirated DVDs or software, or to wear counterfeit branded clothing and watches that are difficult to differentiate from the real thing. Hence the ‘post-truth’ world can serve us very well! But what about the role of market research in the ‘post-truth’ world? Certainly, few clients would want to have false research results unless they have a particular agenda—for example, if someone wants to get hold of higher than actual customer satisfaction ratings because it impacts their bonus. However, the more difficult issue is getting around false self-reporting from respondents in surveys. We have seen new research methods in the ‘post-truth’ research world, such as neuro-insights and alternative qualitative techniques, but we need to understand more about how peoples’ views are formed and how they are influenced, rather than resorting to fancy technology or qualitative research. It is perhaps better to understand more about how people’s opinions are formed, rather than just the opinions themselves. Nowadays, information is more widely available, so people feel ‘informed’. News providers are removing barriers to being informed. For example, a champion of false news from the UK, The Sun newspaper, has now removed its subscription to gossip and showbiz news so that its ‘content’ is available to all, free of charge. There is an increasing adherence and attraction to opinion, maybe as a result of being overwhelmed with information, either factual or false. People are also gravitating to forums to confirm their own prejudices and biases, and to draw comfort from having their views reinforced in this way. As a result, the market research industry needs to change the way it asks questions. There needs to be more focus on opinion rather than the use of scales, and more emphasis on assessing what influences the way people think or form judgements, and on weeding out the inconsistencies. The most publicised inaccuracies of late have been in the polls for elections, most notably in the UK and the US—supposedly world leaders in market research. UK pollsters have struggled to identify the ‘shy’ right-leaning consumers that have unexpectedly returned Conservative governments to office or influenced the Brexit result. More research needs to be undertaken into why people say one thing in focus groups or to pollsters, when their actual behaviour turns out to be different. We can always re-contact such respondents to understand whether they have actually followed through on what they reported earlier in surveys or whether they have changed their minds (e.g. after they voted), and what the reasons were behind their change of opinion. These ‘tipping points’ could potentially be predicted if we knew more about the ways in which people are influenced. Sometimes the inaccuracies are about ‘splintered attention’—someone might start reading an article and be appalled by the extremity of the thoughts but find themselves persuaded on reflection or when the buck stops (e.g. in the polling station rather than at the end of a phone during a poll in the comfort of their own home). When surveys are conducted, researchers might contact people in their ‘splintering time’, which could be unrepresentative of their views (even if it is a representative sample). This raises questions about ‘point of time’ opinions that can be impacted by the respondents’ mood, who they are with at the time, and now, in the days of mobile research, where they are. This points to a need to conduct more longitudinal research, establishing how consumers’ views evolve and what the tipping points are along the way. However, today clients want faster and cheaper surveys, so the question is whether the research industry has the time or the budget to really examine the truth.